SALT LAKE CITY (AP) When Ricky Rubio was shoved to the floor twice, it didn’t take long for the rest of his Utah Jazz teammates to come to his defense. ”On this team, we all love each other, so that makes it easy to stick up for each other,” rookie Donovan Mitchell said. Mitchell scored 23 points to lead the Jazz to a 116-88 victory over the Phoenix Suns on Thursday night, their eighth consecutive victory. ”We have a group of guys here that put the team first and we all care about winning and defending,” said Rudy Gobert, who had 21 points and 13 rebounds. Joe Ingles scored 17 points, including four 3-pointers, and Jae Crowder added 12 for the Jazz, who have won 20 of their last 22 games. T.J. Warren paced Phoenix with 19 points while Josh Jackson had 17 and Devin Booker added 12. The Suns have lost seven in a row. The Suns’ body language showed frustration and it boiled over as the Jazz took firm control of the game. With Utah leading 69-50 in the third quarter, Rubio was headed full speed on a fast break when Jared Dudley body-blocked him to the floor, starting a scrum in front of the Suns bench. Dudley got a flagrant 2 foul and was ejected, along with Marquese Chriss for pushing Rubio back down after Dudley’s shove. Ingles and Mitchell were assessed technical fouls. Ingles and Mitchell disagreed, saying they just backing up their point guard. ”There is a camaraderie and a sense of brotherhood and they defend each other,” Utah coach Quin Snyder said of his team. Rubio had 12 points and 11 assists, and Dante Exum made his first appearance of the season for the Jazz and finished with 10 points. 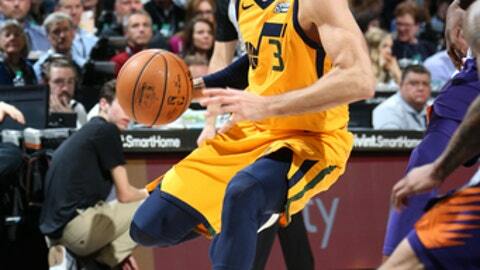 With 1:16 left in the first quarter, Exum entered to a loud ovation after a long rehabilitation from shoulder surgery in October. Because of Gobert’s presence, the Suns took a number of twisting high-arcing floaters and often cut short drives to the baskets. The Suns also committed 22 turnovers while struggling to get clean looks. Spurred by Mitchell’s two dunks and a 3-pointer in the final two minutes, the Jazz opened a 56-43 lead at halftime after trailing early in the second quarter. Suns: Booker, who injured his right hand during practice Wednesday, was a game-time decision and couldn’t find much success against the Jazz. Facing a variety of defenders, Booker shot 3 for 18 and had four turnovers. … Starters Dragan Bender and Alex Len both went scoreless in the first half. Jazz: Crowder has led the Jazz bench in scoring in 12 of the 14 games since coming over from Cleveland in a trade. … Utah ranks second in scoring defense and improved to 27-5 when holding opponents under the century mark. Oft-injured point guard Dante Exum, who has played in just 149 games since he was drafted fifth in 2014, was cleared to play for the first time this season. ”He made a choice that he was going to attack it. There’s been a determination … not just to rehabilitate his shoulder, but also to stay connected mentally and stay a part of the group is something that he’s (done). It would be easy to disconnect and become detached and wallow in your misery and he just didn’t do that,” Snyder said. Utah led by 20 in the fourth but Snyder was still coaching. While Mitchell celebrated an alley-oop to Gobert, Snyder called a timeout and charged out to mid-court to correct Mitchell’s positioning a couple plays earlier. ”He wants me to understand matchups and situations,” the rookie said. ”It’s all part of the learning process … for a coach to come out and talk to a player like that and help me out was huge.” Mitchell wasn’t embarrassed by being singled out. Suns: Host the Golden State Warriors on Saturday night. Jazz: Host the Sacramento Kings on Saturday night.